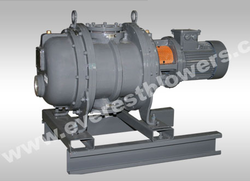 Everest Blower Systems Private Limited - Manufacturer of twin lobe air blowers, biogas blowers and compressors & tri lobe roots blowers in New Delhi, Delhi. EVEREST, a leading manufacturer of Air Blowers in India offers twin Lobe air blower available for flow rates from 25 m3/hr to 10,000 m3/hr in single stage & up to any capacity in parallel configuration, for working pressures up to 1 Kg/cm2. Everest Air Blower is a positive displacement machine, which discharge a constant volume of air when operated at a constant speed. These machines are suitable for both pressure and vacuum applications. Pressure is not developed inside the blower but by the demand of the system. Differential pressure, therefore, varies to meet the load conditions and system resistance. Horsepower required is proportional to the differential pressure across the suction and discharge of the blower. The air delivered is 100% oil free. They are extensively used in cement plants, pneumatic conveying systems, effluent treatment plants for aeration, water treatment plants for backwashing of filters, blending of powder material, agitation of chemical solutions, aquaculture, electroplating, etc. Special Biogas~Gas Blowers are also available. Everest blowers are manufactured on sophisticated CNC machines to ensure high quality of workmanship resulting in interchangeability and high performance. Blower acoustic hood assemblies are also available to cut down noise to the acceptable tolerance range. They are available as package units, ready to install or as bare units for replacement. EVEREST Biogas Blowers | Compressors based on Positive Displacement Air Blower principle, have been specially developed for pumping of Biogas. These are generally used in biogas lines to boost the gas pressure to meet the burner input demand. These are generally vertical flow type in construction, i.e. suction top & discharge at bottom, so as to prevent any accumulation of corrosive matter inside the casing. Since they operate in closed loop, suction and discharge silencers are generally not required. Special material of construction, lubrication and sealing arrangements make them ideal choice for Biogas boosting applications. Provision for a vacuum switch is provided at the inlet of the blower, so that incase the biogas generation falls below the pumping speed of the blower, the blower trips and this prevents vacuum overloading. Similarly provision for a pressure switch is provided on the discharge line to safeguard the blower against excessive discharge pressures. 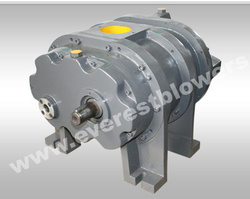 Special blowers, capable of handling different gases, are also available at Everest. Material of construction and constructional details vary to meet different gas requirements. For inflammable and toxic gases, leak tightness is ensured. Basic designs are modified, depending upon the nature of gas to be handled and customers’ requirements. Water jet injection cooling can also be provided to keep the gas temperatures low. All blowers are manufactured on state of the art, imported CNC machines, machined to close tolerances with high degree of accuracy on profile machining, ensuring high volumetric efficiency. EVEREST, leading manufacturer of Roots Blowers in India, introduces the all new Tri-Lobe Roots Blowers. Tri-lobe technology means blowers have lobe tips exposed to 120 degrees around the rotor instead of 180 degrees as in a bi-lobe blower. This provides a stiffer rotor set, meaning less deflection at any load. These blowers have been designed keeping the specific demands of the industry of continuous duty operation, sturdy design, reduced noise, reduced pulsations and vibrations, longer bearing life and minimal maintenance in mind. Everest Blowers are produced on the latest state-of-art CNC machines from Haas (USA) and HMT (India), thereby ensuring a quality product. These blowers are designed for continuous duty service. Complete package units are shipped with all essential accessories and electric motor, ready to install, on plug and play concept. An Everest Tri-Lobe blower is supplied with built-in safety & monitoring equipment such as safety relief valve and pressure gauge. Everest Tri-Lobe Blowers/Compressors are positive displacement units, whose pumping capacity is determined by size, operating speed and pressure conditions. It employs two Tri-Lobe impellers mounted on parallel shafts, rotating in opposite direction within a casing closed at the ends by side plates. As the impellers rotate, air is drawn into one side of the casing and forced out of the opposite side against the existing pressures. The differential pressure developed, therefore, depends upon the resistance of the connected system. The Blowers, being positive displacement type, do not develop pressure within the casing but the discharge pressure depends upon the system resistance/back pressure. Effective sealing of the compressor inlet area from the discharge area is accomplished by use of very small operational clearance, eliminating the need of any internal lubrication of the lobes. A pair of accurately machined alloy steel, hardened and ground timing gears maintain clearances between the impellers, during rotation. The air, thus delivered, is 100% OIL FREE. The pumping capacity of a lobe compressor, operating at constant speed remains relatively independent of inlet and discharge pressure variations. These Blowers are constant volume machines, which deliver a fixed discharge against the system back pressure. It is, therefore, essential to ensure that minimum pipeline restrictions, at the inlet and discharge, are imposed. Adequate size piping and large radius bends ensure minimum line losses resulting in higher efficiency and low power consumption. Sudden change in pipeline cross section should also be avoided. To change capacity, it is necessary either to change speed (energy saving) or vent some of the air into atmosphere (not energy saving). The air must not be re-circulated from the discharge to suction as it may result in overheating of the tri lube blower. No attempt should ever be made to control the capacity of compressor by means of throttle valves in the intake or discharge piping. This increases the power load on the motor and may seriously damage the compressor. There is an increase in the discharge air temperature due to heat of compression. As a thumb rule the discharge air temperature increases @ 100C for every 0.1 Kg/cm2 of P above the inlet temperature. EVEREST, leading manufacturer of Roots Blowers in India, introduces the all new Vertical Tri-Lobe Roots Blowers. These blowers have been designed keeping the specific demands of the industry of compact & sturdy machine, reduced noise, minimal space requirements, least vibrations, longer bearing life & minimal maintenance, in mind. Everest blowers are produced on latest state-of-art CNC machines from USA ensuring quality product. Complete package units are shipped with all essential accessories & electric motor, ready to install on plug & play concept. 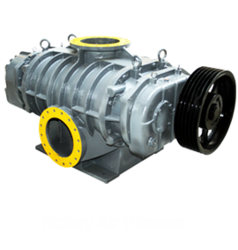 These blowers are designed for continuous duty service & require minimal maintenance. Everest Vertical Tri-Lobe Blowers come with built-in safety and monitoring equipment such as safety relief valve & pressure gauge. Tri-Lobe technology means blowers have lobe tips exposed to 120 degrees around the rotor, instead of 180 degrees as in a bi-lobe blower. This provides a stiffer rotor set, meaning less deflection at any load. These blowers provide 100% Oil Free Air & are extensively used in Sewage Treatment Plants, Effluent Treatment Plants, Aquaculture, Chemical Plants and Electroplating Plants. Quieter Operation: The Tri-Lobe rotor enables smooth air output, with less pulsations. This results in a significant reduction of emitted sound. Longer Life: The smooth power cycles means less “impacting load” and results in longer bearing and unit life. A convenient sight glass makes it easy to check oil levels. Drain valve is mounted in the front of the unit, hence easily accessible. Direct coupled drive resulting in increased drive efficiency, reduced noise and longer service life. Built-in monitoring and safety equipment such as pressure gauge and safety relief valve. Anti-vibration pads absorb vibrations before they reach the floor. Easily mountable suction air filter with non woven polyester media for surface and depth filtration. Mean pore size 25 microns. 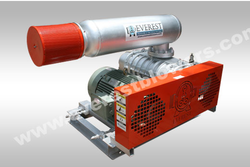 Everest Blower Systems Pvt. Ltd. manufactures high-quality vacuum systems for various needs of multiple industries. Just like Rotary Vane Vacuum Pumps, these are among the newest addition to the pumping industry. As the name suggests, dry screw vacuum pumps work on a ¿¿no oil, no water¿¿ principle that makes them extremely reliable for environment-friendly applications. 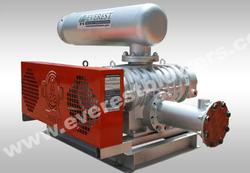 Everest is the Leading Developer & Manufacturer of Sophisticated Vacuum Pumps & Systems. Everest Two Stage Liquid Ring Vacuum Pumping Systems provide the optimum for solution for many rough Vacuum Application in the Chemical & Allied Process Industry. Two Stage Liquid Ring Vacuum Pump & Systems are an efficient solution for continuous operation on low pressure. (1) Pharmaceutical for Distillation & Drying Process. 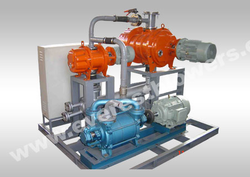 (1)	These Vacuum Pumps can be supplied bare or as combination along with Mechanical Vacuum Booster for Improved Displacement and Higher Process Vacuum. 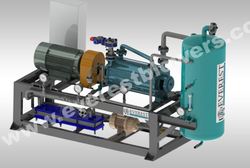 (2)	Kindly consult the Team of Everest Engineers, regarding your Individual Applications based on which shall be happy to Design & Supply suitable type of Vacuum Systems. (3)	Product Improvement is continuing Goal at M/s Everest Blower Systems Pvt. Ltd. – Design Department & Specification are subject to change without any prior notice or obligation. 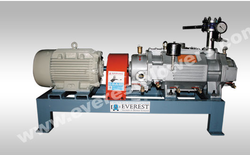 Everest is one of the leading worldwide manufacturers of vacuum pumping systems. These systems comprises of Dry Screw Vacuum Pumps, Mechanical vacuum boosters, Reciprocating pumps, Liquid Ring Pumps etc. In its latest development, Everest introduces Oil Syst Vacuum Pump with sealing fluid as oil for applications requiring high level of vacuum with minimum running cost. This is a highly engineered product with lots of research & development for years with in its back. With the experience acquired through decades of engineering, research, continual investments in the latest technological advanced machinery and mechanical know – how, Everest’s product is today synchronous with high quality, high efficiency, robust construction & maximum reliability. Oil Syst vacuum pump with motor. 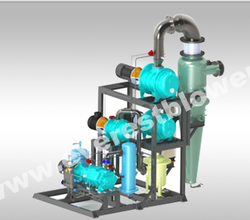 Air liquid separator to vent air free of oil “smoke” or fumes. Heat exchanger specially designed for optimum performance. 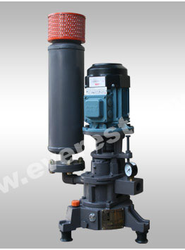 Pressure relief valve to release the excess pressure developed, if any. Flow meter to monitor the required flow. Temp & pressure gauges to monitor the readings. Non return valve at the suction of the system to prevent back streaming of oil. Shut-Off Vacuum <5 Mbar. However with Mechanical Vacuum Boosters we can achieve a vacuum <1 Mbar. Cashew Nut Shell Liquid (CNSL) or Cashew Oil or Cashew Nut Shell Oil is a dark reddish brown viscous liquid, extracted from a soft honey comb structure inside the cashew shell. It is a natural and renewable bio-material. Thus, it offers much advantage over synthetics. CNSL is often considered as cost effective and better modern materials for unsaturated phenols. Moreover, due to its versatility, CNSL has over 200 patents on its industrial applications. Recently, research has also shown that the CNSL constituents contain special structural features, which can be useful for manufacturing of specialty chemicals and high value polymers. So the main purpose of CNSL extraction is to get Cardanol oil which is widely used in industries. Physically extracted CNSL contains anacardic acids 70%, cardol 18% and cardanol 5%. Anacardic acid present inside CNSL is converted to Cardanol which is widely used in Industrial Process like vehicle’s brake lining as binder or friction powder and for surface coating, such as in anticorrosive paint, varnish, and lamination, used as brick, concrete, steel, and plywood sealer. Cardanol is basically a monohydroxyl phenol with a long carbon chain in the metaposition. It has the potential as a substitute for phenol in resin phenolic-base chemical products. Main Process of Cardanol extraction from Natural CNSL comprises the conversion of natural CNSL into technical CNSL in which anacardic acid is decarboxylated into cardanol. Compressors based on postive displacement air blower principal.